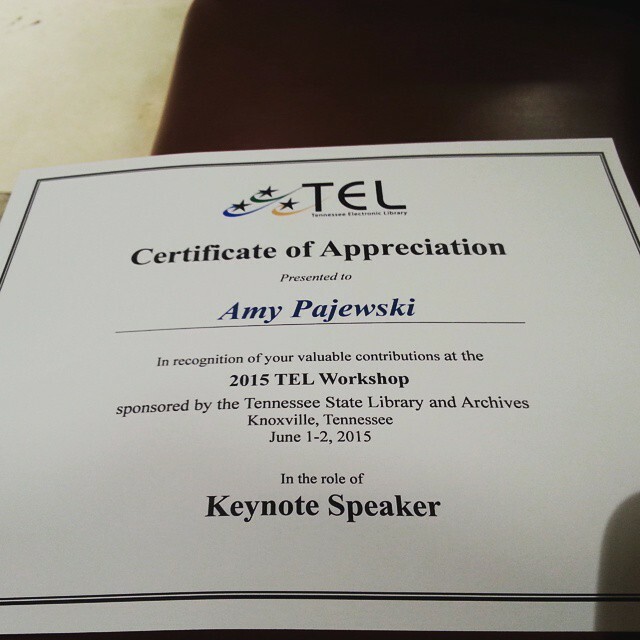 Last week, I had the opportunity to give the opening keynote speech at the Tennessee Electronic Library (TEL) workshop at the University of Tennessee, Knoxville. And you guys, it was awesome. I think this was the most comfortable I’ve ever felt speaking in front of an audience because the entire workshop was designed to get Tennessee librarians inspired to get out and creatively market to their users– they even got to work through developing a marketing plan for their very own libraries. This is what I love. This is the kind of thing I want to help people achieve. I love the way this meeting turned out because it got people excited and ready to implement a concrete plan. Many times at conferences, we get excited and inspired but then we get home and lose the energy to actually use the ideas, or maybe we get so inundated with information that it’s just too much to process. But my experience with these librarians is that they truly believe that TEL is an excellent resource, and they want everyone to know it, and I wanted to help them. TEL is a collection of article databases, eBooks, and other online resources available free of charge to all Tennessee state residents. It helps people find jobs, research their family history, learn languages, practice for college prep and career certification tests and do all the kinds of research needed by students from kindergarten through college. And that’s awesome. In Texas, we have a similar collection called TexShare, but I’ve found that it’s hard to get college students excited about it since we have so many other subject-specific databases that are more useful for traditional research papers. I was excited to learn about ways academic Tennesseans are using TEL, and it was totally adaptable to my own institution. Since TEL appeals to K-College, my audience comprised of school, public, and academic librarians. I was pretty worried about being able to adapt to all of these areas, but as I was developing my talk, I realized that we are all educators, artists, and stewards. We all have similar goals when it comes to outreach and we can all work together to market to our unique audiences. I began my talk by gushing over my own experiences with libraries, how my mom used to take me to all the area libraries, even driving to Delaware so I could see the hamsters at the Newark Public Library. I believe that libraries are about experiences, not so much about the stuff, but about creating a memorable moment. 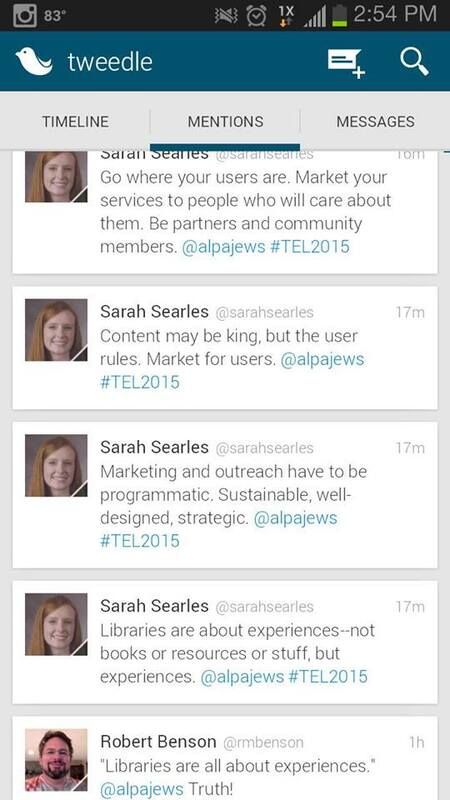 How can we tap into that ethos when we’re marketing? How can we create memories for our users by also integrating these resources into their daily lives? Marketing must be sustainable, well-designed, and strategic. 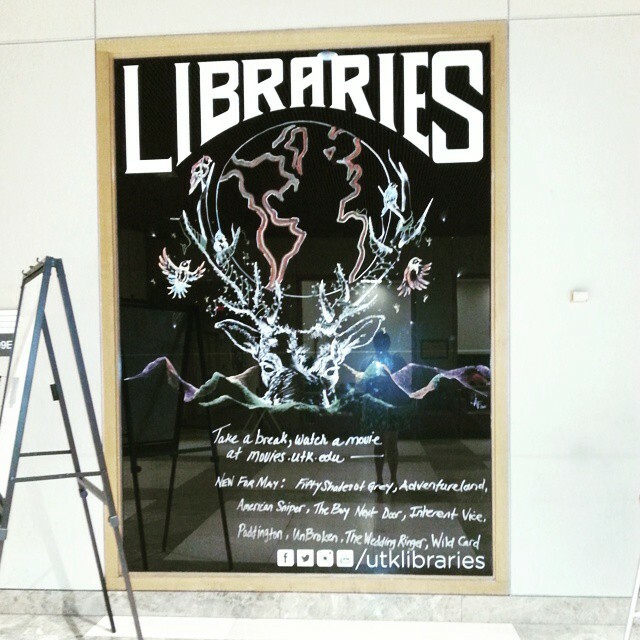 Content in libraries is no longer absorbed, it’s created. As stewards, we must provide resources to users that meet their needs and we need to meet them where they are, wherever they are. I think we need to create community, a sense of belonging, passion, and cultivate creativity & enthusiasm. But the only way to do that is to know, really know, our users. I recommend that the audience do a little inventory of their community. Think about all of the things their community has– i.e. hospitals, schools, rotary club, craft clubs, etc. Then think about how you can apply what resources and spaces you have to those places within the community. The goal, really, is to market strategically by first partnering up with the surrounding community– become immersed in the community, become the user, then build relationships. I reminded the audience that in order to be targeted, we need to really think about where we are marketing. First decide who you’re marketing to, then figure out where they are, then brainstorm the best way to meet their needs. Instead of the age-old, just blast everyone everywhere on every channel we have, we want to make it more personal. The thing is, when it comes to marketing, not everyone cares about everything. The more stuff we put out there, the more desensitized people become. We want to make sure that we’re only focusing on a small group (I recommend no more than 3 user groups) and appealing to those users only. Remember, keep it simple, keep it elegant, keep it beautiful. You don’t need the fanciest design software to make things beautiful. And, if you have absolutely no design experience, consider partnering with someone in your community who can. Basically, we can do this. It’s not out of our reach. We are all creators. Big thanks to Erin Loree, Kathy Bennett, and Heather Lambert from the Tennessee State Library for thinking of me for this talk. It was a great experience. Always happy to find others who get excited about marketing & promotion! That’s what I speak and write about constantly.